Established relatively recently at the beginning of this century, American company DeVore Fidelity has picked up plenty of plaudits on its home turf, while proprietor John DeVore – himself something of a youngster by hi-fi industry standards – brings a welcome breath of fresh air to our sometimes rather stuffy industry. He presumably also has a thing about apes. 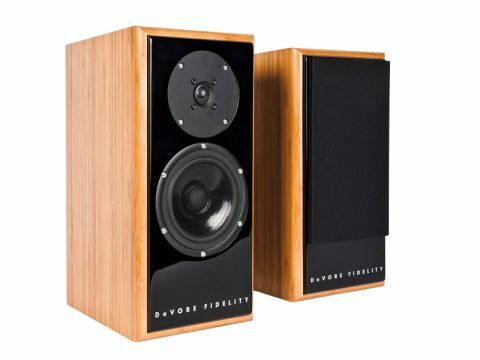 Of the four loudspeaker models in the current DeVore portfolio, three make up the Gibbon series while the top model is a Silverback and 'gibbon' also seems to be the name applied to the company's proprietary crossover design technique. That said, though very entertaining for browsers, the website did seem rather weak on hard facts. The four-line specification and additional information is very sparse, and doesn't discuss how this 3XL has evolved from earlier Gibbon 3s, or provide any real and useful information at all. This Gibbon 3XL is the smallest model in the range and the only standmount. It also costs £3,000, give or take a fiver, which seems rather expensive for a compact two way stand-mount, though the price does include an attractive pair of wooden stands. Due to a long-term accumulation of numerous display stands, we elected instead to use our regular reference 600-millimetre Kudos S100s, with Blu-Tac coupling between speakers and stands. It should be pointed out that this is unquestionably one of the most beautifully finished and presented speakers we have ever seen. A quite deliciously figured, high-gloss polished real-wood veneer forms the wrap, with nicely rounded edges front and back. The inset front and back panels are both finished in high-gloss black, and an optional mini-grille is held in place by hidden magnets. The whole thing feels extremely solid, possibly helped by the fact that the carcass is made from bamboo ply. The two drivers are nicely rebated and held by shiny screws. The main driver here has a cast frame and a 100-millimetre doped paper cone. The tweeter is apparently the same as that used in the top-of-the-line Silverback model and has a 19-millimetre dome diaphragm. The Gibbon 3XL's sound quality turns out to be a bit of a mixed bag. It certainly has considerable charm and good vocal expression, thanks to a fine midband, but above and below that most important part of the audio band things are rather less satisfactory. In the way that it majors on a good sensitivity upper midband, the Gibbon 3XL is somewhat reminiscent of a speaker system based on a single full-range driver. It has fine coherence with good timing and some dynamic expression, but the top end is a bit dull and restrained, so the sound and soundstage lack some airiness and openness. The bass drives along purposefully, helped by low box coloration and a fine dynamic range, but with limited ultimate weight and some lack of warmth and harmonic richness through the upper bass and lower midband. The speaker sounds attractively informative, when operating quietly, but when the volume is turned up, the voice band can become a little uncomfortable and too forceful, and the frequency imbalances are a bit too obvious – cymbals and other percussion tend to jump out. While the Gibbon 3XL will undoubtedly win many friends, it does lack strict neutrality.